All Are Invited to Join the Action on National Blvd. Beach July 17-21. Long Beach, NY – July 15th, 2013 – Sponsored by NYSEA, the fourth annual NY Surf Week will be held on National Blvd. Beach in Long Beach July 17-21. NY Surf Week was started as a memorial surf contest for lost New York surf legend George “Geeza” Geiser. It features surf contests, skateboard contests, family night on the beach, concerts and much more. “NY Surf Week has evolved as a bigger and better event over the past three years,” described co-founder and internationally-recognized big wave surfer Will Skudin. “While Superstorm Sandy wreaked widespread devastation last fall Long Beach is back in business, and NYSEA invites everyone to join us in the celebration,” he stated. See Events Schedule below for a complete list of all the “gnarly” activities for surfers, skateboarders, artists, party animals, music lovers, adults and children. Visit their Facebook Page or www.nysea.com/nysurfweek for more information and to register for NY Surf Week activities. NY Surf Week also is sponsored by Vita Coco Coconut water and WRV Surfboards. Register online. 48 surfers only. $3,000 purse. Not-for-profit Surf for All surfing for visually impaired and blind children. 80 West Broadway, 2nd Floor. Not-for-profit Surf for All benefit. 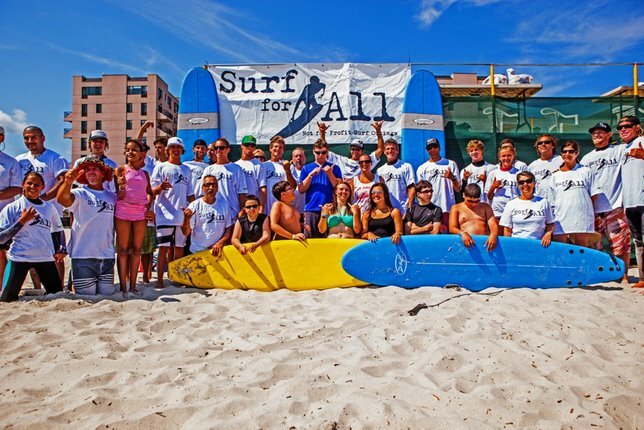 Not-for-profit Surf for All surfing for students with physical and medical disabilities. Long Beach Hotel, 405 East Broadway. NYSEA Sneak Peek Movie Premiere. Buffet, raffles and games. NYSEA Movie Premiere, indoor skateboard jam. Register online only. Boys & girls divisions. 16 and under. Register online only. Boys & girls divisions. 17 and under. Live music all day during skate jams. Epic line-up, featuring Groundswell, Jahstix & more. 5 pm sign ups, first 40 entrants only. 18 +. 6-7 pm warm up. 7:30 pm start. Cash purse. Subject: LongIsland.com - Your Name sent you Article details of "Catching Waves In Long Beach - NY Surf Week Begins July 17th"